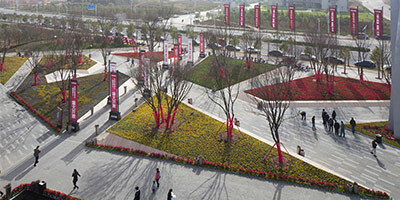 The Central Plaza continues a dynamic design language established with Arrival Square launched in 2013. As a precursor to a host of social and community programs for a new residential precinct, the plaza is envisioned to accommodate a high demand for civic spaces and recreational activities for its future residents. In so doing, we hope that the plaza serves not only as an events venue for commercial activities, but also an interesting node for the public and residents alike to congregate, interact and play in the neighborhood for many years to come. The notion of social interaction tends to be casual in Western cultures. People converse randomly in the parks, lawn and alfresco cafes. Conversely in Eastern cultures and especially with the Chinese, they are more introverted in nature. Many take the opportunity to gather for active sports such as tai-chi, dance and a host of other exercises. In particular, the playgrounds for kids and teens alike are the most popular that encourage participation and enliven the public realm. The landscape strategy was to charge the plaza with a wide range of programs designed for the young and old. These include a Dry Fountain, a Mist Garden, the Runway, a Children’s Rock Climbing Wall, a Sunken Playground and a Skating Rink with seating areas dotted all around to encourage a ‘see-and-be-seen’ social interaction. The animated Star Promenade, made of environmentally friendly resin-bonded granules, strings together these independent spaces and leads the public to the future diagonal shopping street. Towards the shopping area in the north, a series of alfresco spaces integrated with reflecting pools and water cascades are created to breakdown the scale of the long commercial facade. The sound of water along with open lawns buffers the retail zone from the busy Central Plaza as a quieter atmosphere conducive for food and beverage. 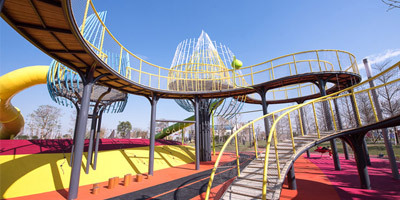 As the population of Zhengzhou Vanke City continues to grow and more amenities in the vicinity complete, the Central Plaza will prove to become a popular, memorable and important hub for all who frequent the precinct. We endeavour every opportunity in the place making of this public sphere as more civic spaces unfold in the near future. A series of elevated landforms cut and construct a topography to augment a flat site into an ever-changing experience.